Hadoop is one of the most popular open-source distributed computation frameworks, popularized by the widely used MapReduce computation paradigm. However, recently, Hadoop as been trying to distance itself from a single computation model and provide an abstraction layer over a cluster of machines with which you can easily develop a great variety of fault-tolerant and scalable distributed computation paradigms. In a sense, Hadoop is now trying to become a "kernel" of the distributed cluster, handling the low level details so you don't have to, a kind of Linux for clusters. Better scaling due to reduced centralization of responsabilities. Should easily support over 10K nodes, 10K jobs and 100K tasks (previous generation started getting into trouble at 4K nodes and 40K tasks). More flexibility in resource allocations. You can now easily specify the requirements of each individual container directly in your YARN application, specifying needed RAM, CPU cores and even specific hosts on which the container should be allocated. Previously this was limited to global memory and CPU limits for all containers specified in configuration files. More flexibility in computation. Previous Hadoop generations only ran MapReduce jobs. With YARN, Hadoop can run virtually any kind of computation. MapReduce is still possible but is implemented as a backwards-compatible module called MapReducev2 (not enabled by default). Other modules exist such as Giraph for graph processing, Spark for general computations with intermediate results stored in memory, etc. Better failure handling. Previous generations had a single point of failure in the JobTracker losing the entire job queue in such an event. New generation has (or will soon have) recovery of both ApplicationMaster (through a restart by the ResourceManager) and the ResourceManager (through ZooKeeper, YARN-128, YARN-149, YARN-556). Wire-compatible protocol. This should guarantee protocol compatibility even between different versions of Hadoop so you no longer have to worry about having to simultaneously update the entire cluster and can do rolling upgrades. This guide is based on the most recent GA (general access) version of Hadoop (2.2.0 at the time of this writing) although I'll make an effort to keep it up to date with future releases (UPDATE: tested and working up to version 2.6.0). If something doesn't quite work for you, let me know in the comments and I'll try to help. I'll try to keep the instructions distribution agnostic so it applies to a greater audience but this installation is targeted for Linux-based machines. Certain distributions might have different hadoop packages in their repositories although these are usually outdated and have strange structures. Another advantage of the installation I'll be detailing here is that it doesn't require root to run. In this section, we'll cover single node installation. If you just want to setup an Hadoop installation for testing or to play with, this is probably enough. If you want to install Hadoop on a cluster, you should also start by following this section on one of the nodes in the cluster to make sure you got all the dependencies right and then go over the steps in the Cluster Installation to configure that installation for cluster operation. Also, you should install a java virtual machine (JVM). I usually go with OpenJDK's JRE 7 but any other should do. And that was it! Easy right? Now lets just set up some environmental values needed by some scripts inside Hadoop and also to facilitate references to the installed location. The following lines should be added to either your ~/.bashrc (if you use Bash); ~/.zshrc (if you use Zsh); ~/.profile (I know this works with Bash, not sure about others); or whatever file your usual terminal shell uses to setup environment variables and alias. 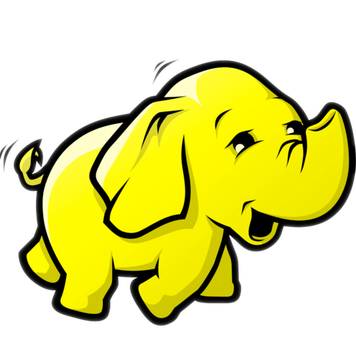 export HADOOP_PREFIX="/home/alex/Programs/hadoop-2.2.0" # Change this to where you unpacked hadoop to. Now lets move on to configuring the 2 main components: HDFS and YARN. HDFS is the distributed file system used by Hadoop to store data in the cluster, capable of hosting very very (very) large files, splitting them over the nodes of the cluster. Theoretically, you don't need to have it running and files could instead be stored elsewhere like S3 or even the local file system (if using a purely local Hadoop installation). 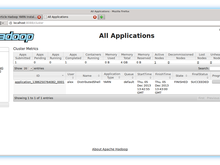 However, some applications require interactions with HDFS so you may have to set it up sooner or later if you're using third party modules. HDFS is composed of a NameNode which holds all the metadata regarding the stored files, and DataNodes (one per node in the cluster) which hold the actual data. Make sure to replace /home/alex/Programs/hadoop-2.2.0 with whatever you set $HADOOP_PREFIX to. In addition, add the following to $HADOOP_PREFIX/etc/hadoop/core-site.xml to let the Hadoop modules know where the HDFS NameNode is located. YARN is the component responsible for allocating containers to run tasks, coordinating the execution of said tasks, restart them in case of failure, among other housekeeping. Just like HDFS, it also has 2 main components: a ResourceManager which keeps track of the cluster resources and NodeManagers in each of the nodes which communicates with the ResourceManager and sets up containers for execution of tasks. As in the HDFS case, whenever you see /home/alex/Programs/hadoop-2.2.0, you'll want to replace it by the content of your $HADOOP_PREFIX variable. The values above were the ones I used on my 6GB laptop with 4 virtual cores. In a nutshell, I'm saying that of those resources, I want Hadoop to use at most 4GB and 4 virtual cores and that each container can have between 128MB and 2GB of memory and between 1 and 2 virtual cores. With these settings, I can run a minimum of 2 containers with maximum resources at a time: 2 containers with 2GB and 2 virtual cores. You should adapt these to your specific case. Hopefully, everything should be running. Use the command jps to see if all daemons are launched. If one is missing, check $HADOOP_PREFIX/logs/<daemon with problems>.log for any errors. # Run Distributed shell with 2 containers and executing the script `date`. # Check the parameters for the DistributedShell client. If you have correctly followed this guide and if the gods are favourable towards you, you should see time strings with the current time, one for each container. If that's the case, good job! You've just setup a single-node installation of Hadoop YARN! If your objective is to setup a whole cluster, carry on to the next section. Otherwise, and if your objective is to run MapReduce jobs, jump to the last section because we need some extra configuration to allow the running of MapReduce jobs over YARN. NOTE: This is a continuation of the configuration steps for single-node executions, so make sure to read that first. Having configured Hadoop in a single node, configuring it in an entire cluster is not that hard. Basically, you just have to install Hadoop on all the nodes and use the same configuration (at least the endpoints of each of the services) on all of them. However, this time, you won't be running all the daemons in all the nodes. Per cluster you'll have a single ResourceManager and one (or more if using secondary/backups) NameNode. DataNode and NodeManager daemons should be run in all the nodes if you have a small cluster and/or a small number of jobs. With a bigger cluster or a bigger number of jobs you might want to have a dedicated node for both the ResourceManager and NameNode to reduce contention. All the machines with a DataNode and NodeManager are called slaves (a slave can also be a master if you run the other daemons on the same node as we did on the single node setup). For the YARN configuration, you can customize the entries we saw on the single-node installation (memory and CPU) to the resources of each node. But you'll then have to add the hostname of the ResourceManager to all the yarn-site.xml. If you want to customize the ports, check the default configuration for the parameters you need to change. NOTE: If your installed Java package doesn't do it by default, the above scripts can complain about an incorrect $JAVA_HOME environment variable. To fix this, point it to the directory where Java was installed. In my case, it is: /usr/lib/jvm/java-7-openjdk. For greater flexibility and for automating the downloading and extracting of the Hadoop package or even the allocation of computation nodes via, for example, EC2 or Azure, you might want to use custom deployment scripts and frameworks. Some of the options here would be Fabric, Vagrant, Puppet, Chef, among many others. Since I usually only setup Hadoop clusters on "normal" dedicated servers, I'm quite partial to the simplicity of Fabric. I have created a script for deploying Hadoop on my clusters which I'll share with you in the next paragraph. This script assumes the machine where you run it (it doesn't have to belong to the cluster, might be your simple laptop) has SSH access to all the cluster machines and that you have managed to install Fabric (which requires Python 2 and Paramiko) on the machine where you want to run it (don't need to install it on any other). Assuming you configured everything correctly that should have worked ok. If not, drop me a comment and I'll try to help you! No other application is running on that port fuser -v -n tcp <port number>. If it is, kill it or use a different port (change the respective *-site.xml). The hostname of your node should point to its internal address. This is configured through /etc/hosts. For example, in my resourcemanager.alexjf.net node, the /etc/hosts file contains something like 192.168.1.1 resourcemanager.alexjf.net. To find out the IP address you need to put there use ifconfig eth0. Nodes are accessible from one another using the URLs you defined in the configuration. If this is not the case, you should unblock ports and/or add extra mappings to /etc/hosts. My Fabric script described above has a special command to map the public URLs used in the configuration to cluster-private IPs directly to the hosts file of every node: fab setupHosts. This command also writes these private IPs to a file in the home directory of the ResourceManager host. # Execute the DistributedShell app with the 'date' command. Whereas in previous versions of Hadoop MapReduce was the only computational model you could use, with YARN this is no longer the case. Thus, up until now, I've kept the entire guide independent from MapReduce executions. If you just want to install Hadoop to run other YARN-enabled applications like Giraph or Spark, the previous sections should have enabled you to setup everything regarding YARN. If, however, your focus is indeed on running MapReduce jobs, then we need to configure MapReducev2, the YARN-enabled MapReduce that ships with the new generations of Hadoop. The java.opts properties specify some extra arguments for launching the Java Virtual Machine for the mappers, reducers and application master. As a rule of thumb, you should limit the heap-size to about 75% of the total memory available to ensure things run more smoothly. With this configuration, I can theoretically have up to 4 mappers/reducers running simultaneously in 4 1GB containers. In practice, the MapReduce application master will use a 1GB container so the actual number of concurrent mappers and reducers will be limited to 3. You can play around with the memory limits but it might require some experimentation to find the best ones. Too low and you'll get out of memory exceptions, too high and you'll have very few mappers/reducers or the ApplicationMaster will consume a great portion of the resources unnecessarily. Also, note that the mapper/reducer memory/cpu settings above are just defaults in case the actual MapReduce applications don't define their own requirements. An application can define requirements much bigger than these in which case it will not be able to run in your cluster. The jobtracker configuration specifies which node of the cluster should be responsible for being the JobTracker. If you're doing a single-node setup, you can leave it at the default value of "local". With this configuration, you should already be able to run MapReduce jobs. MapReduce jobs don't need any extra daemon running other than the ones already launched for pure YARN applications. JobTrackers and TaskTrackers will be launched automatically by the MapReduce Application Master. The RandomWriter program we ran in the previous section is an example of a MapReduce application coded in Java and packaged into a jar. This is the basic way to run MapReduce jobs. Another popular way to run these jobs in previous versions was through MapReduce Streaming applications. In these executions of MapReduce, instead of providing a jar with the compiled Java application code, you provide mapper and a reducer scripts written in any language which read from the standard input and output to the standard output. # won't see that word again. By default, Hadoop stores the logs of each container in the node where that container was hosted. While this is irrelevant if you're just testing some Hadoop executions in a single-node environment (as all the logs will be in your machine anyway), with a cluster of nodes, keeping track of the logs can become quite a bother. In addition, since logs are kept on the normal filesystem, you may run into storage problems if you keep logs for a long time or have heterogeneous storage capabilities. By adding this option, you're telling Hadoop to move the application logs to hdfs:///logs/userlogs/<your user>/<app id>. You can change this path and other options related to log aggregation by specifying some other properties mentioned in the default yarn-site.xml (just do a search for log.aggregation). # Read it in a scrollable window with search (type '/' followed by your query). My Fabric script includes an optional variable for setting the node where to launch this daemon so it is automatically started/stopped when you run fab start or fab stop. Unfortunately, a generic history daemon for universal web access to aggregated logs does not exist yet. However, as you can see by checking YARN-321, there's considerable work being done in this area. When this gets introduced I'll update this section. In addition, you can also use the s3n URL directly as the input for your jobs without having to do an intermediate copy. An alternative S3 filesystem exists with a s3:// URI scheme. However, this is reserved for accessing HDFS-formatted S3 buckets. This stackoverflow question gives a good overview of the differences between the 2 filesystems. Following these instructions, you should easily be able to do a complete Hadoop deployment over EC2. Just launch the instances and configure them as a normal cluster. However, if you're using EC2, chances are the cluster you're setting up will be temporary and you'll have to redo the entire sequence of steps each time you want to setup a new one. To tackle this problem, my Fabric script now includes automatic EC2 instance-finding and bootstrapping. To make use of this function, download the entire contents of the script folder and modify the entries at the top of fabfile.py to reflect your preferences and configuration (make sure you activate EC2 deployment by setting the option with the same name to True and to add your AWS_ACCESSKEY_* values). OpenJDK 64-Bit Server VM warning: You have loaded library /home/hadoop/hadoop-2.2.0/lib/native/libhadoop.so.1.0.0 which might have disabled stack guard. The VM will try to fix the stack guard now. It's highly recommended that you fix the library with 'execstack -c <libfile>', or link it with '-z noexecstack'. I have never noticed anything breaking by not using the native libraries but, if you rely a lot on compression, the Java implementations used as a fallback will surely be a lot less performant than the native ones. 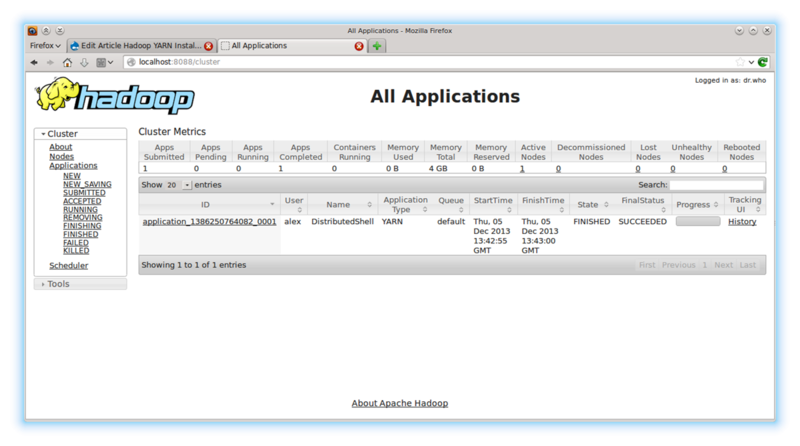 Run Hadoop on a 32 bit JVM. Recompile the native libary under a 64 bit environment - Here you can find the official instructions, and here you can find unofficial instructions for Debian-like systems and a prepackaged hadoop for 64bits. (NOTE: Thank you Chris L. for suggesting this extra section). If you've reached this section and everything's working ok, congratulations! You've just setup a Hadoop Yarn cluster (or single-node setup). This guide has covered the basic aspects of Hadoop. Some other things you might want to consider are authentication, connection with Amazon S3, etc. I'm open to suggestions for other guides and critiques so make sure to give your feedback using the comment form below. 2015-04-24 - Added a section regarding native library and 64 bits incompatibility. 2014-06-27 - Added S3 and EC2 deployment sections. Updated Fabric scripts. Added a section explaining how to add hadoop binaries to the execution path. Fixed wrong if condition in example Python streaming program. Added mapreduce.jobtracker.address to the MapReduce configuration section. Updated the Fabric scripts for server-side Python 2.6 compatibility, more adaptibility and bugfixing. 2014-01-07 - Fixed typos and duplicate command in resourcemanager/nodemanager startup with Hadoop scripts.